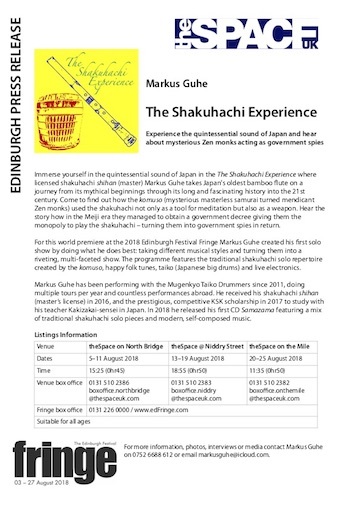 Immerse yourself in the quintessential sound of Japan in the The Shakuhachi Experience where licensed shakuhachi shihan (master) Markus Guhe takes Japan's oldest bamboo flute on a journey from its mythical beginnings through its long and fascinating history into the 21st century. 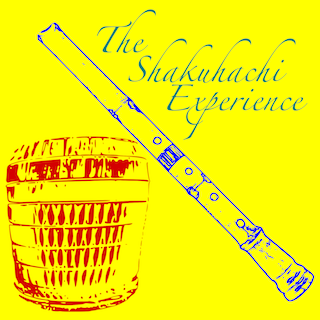 Come to find out how the komuso (mysterious masterless samurai turned mendicant Zen monks) used the shakuhachi not only as a tool for meditation but also as a weapon. Hear the story how in the Edo era they managed to obtain a government decree giving them the monopoly to play the shakuhachi – turning them into government spies in return. For this world premiere at the 2018 Edinburgh Festival Fringe Markus Guhe created his first solo show by doing what he does best: taking different musical styles and turning them into a riveting, multi-faceted show. The programme features the traditional shakuhachi solo repertoire created by the komuso, happy folk tunes, taiko (Japanese big drums) and live electronics. Markus Guhe has been performing with the Mugenkyo Taiko Drummers since 2011, doing multiple tours per year and countless performances abroad. He received his shakuhachi shihan (master’s license) in 2016, and the prestigious, competitive KSK scholarship in 2017 to study with his teacher Kakizakai-sensei in Japan. In 2018 he released his first CD Samazama featuring a mix of traditional shakuhachi solo pieces and modern, self-composed music.